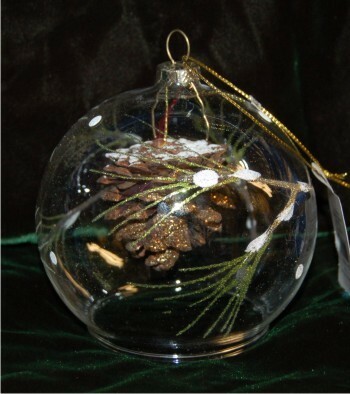 Perfect for the holiday season, this pine cone ornament features a glittered and snow-capped cone inside a gleaming glass globe. The included cord makes it easy to display on the tree where it looks so natural or anyplace it brings a touch of cheer throughout the winter season. The Christmas morning protected pine glass ornament’s globe is frosted with pine leaves too, creating a just-right feel. Our lettering artists will make this a personalized Christmas ornament for your home and friends – the pine cone glass globe ornament is a versatile Christmas gift for anyone on your list.